Onto the second dish with the panang curry paste that I made the other day, “Moo Satay (Pork Satay) with Curried Peanut Sauce”. This one also comes from “The Big Book of Thai Curries”. This dish sounded pretty interesting; instead of being a more standard one dish curry, it used the panang curry in a dipping sauce for a pork satay. The peanut dipping sauce sounded really tasty with coconut milk, lime juice and peanuts in addition to the panang curry. I also added some peanut butter to give it a bit more peanut flavour. The pork is also marinated in in a really nice combination of spices and herbs. This dish turned out to be really good! The peanut sauce was amazing. The pork was juicy and flavourful. I will be making this again. Mix the coriander seeds, cumin seeds, lemongrass, galangal, lime peel, turmeric and salt in a mortar and pestle of a food processor. Mix in the oil and palm sugar. Cover the pork in the mixture and marinate for 3-5 hours. Skewer the pork and grill it for about 5 minutes on each side. Satay is always my fav food. Good on you to try to make it at home! Kevin, I was so impressed your blog! Beautiful pictures and most of all, you tried so many different kinds of food from all over the country! I run into your blog when I was searching “Monte Cristo” image for my take home quiz of my culinary class. I have lived in Thailand when I was young, I love Satay very much. I cook Thai food often at home but haven’t tried this one. Must try recipe for my next Thai food party. Thank you and I will come back! I am from Japan (now living in the US), so I particulary enjoyed your Kabocha-Spinach Miso soup colum, too. 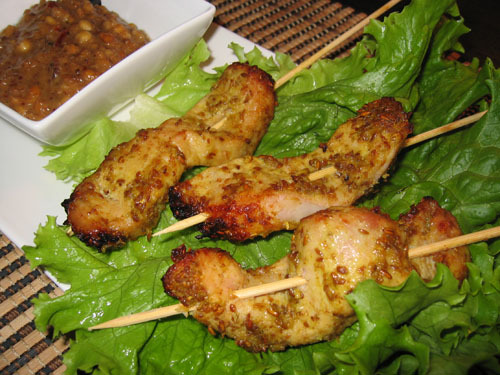 You should make all kinds of satay including chicken, beef, lamb. They are all so good! Great looking satays. Nothing better than dipping sticks of meat. Also, I see that you found kaffir lime leaves. I have had chicken satay before, but never with pork. I’ll have to give this a try! Kevin, as usual, looks and sounds fantastic!